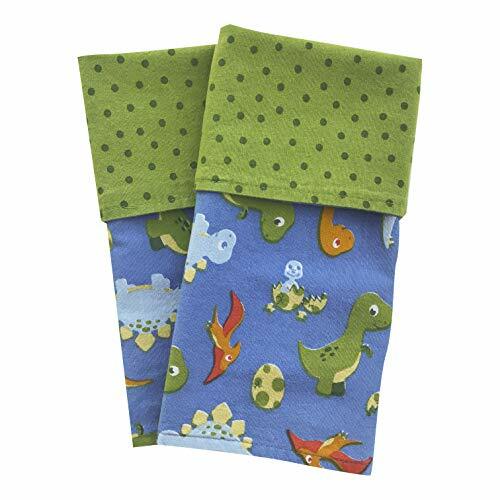 Keep mealtime cleaner and greener with joyful Funkins cloth placemats made especially for kids! Do you have a goal towards a waste-free lunch this school year? Do you want to reduce paper waste at home while saving your family money on disposable paper products? Funkins cloth placemats are an eco-friendly, waste-free mealtime essential that kids and parents love! Created by Moms and made of high quality, pure cotton fabrics, Funkins are soft and gentle for little hands and faces, and come in cheerful patterns that will brighten every mealtime. Double-ply, thick & absorbent, Funkins placemats provide a great protective barrier on public eating surfaces. Funkins ORIGINAL double-ply cloth placemats are made of 2 layers of soft cotton fabric for extra absorbency and durability. Funkins can be added to your regular laundry for easy care. Sized perfectly for lunch boxes, school tables and little laps. Funkins 15"x13" cloth placemats are a great addition to school waste-free lunch programs. Funkins placemats are sized ideally for lunch boxes, school desks and lunch tables without taking up too much space, helping to keep each child's lunch space (and mess!) contained. Funkins are also great to keep in your car or diaper bag/purse for snacks on-the-go - a reusable alternative to wasteful disposable paper towels and wipes. Eco-kind Funkins are a fun party tabletop accessory, and a thoughtful and cute gift that can be used daily for years to come. Coordinate your Funkins placemats with matching cloth napkins, sized slightly smaller at 12"x12" for little ones. And our machine washable lunch bags are as practical as they are cute! Check them out today! SOFT, ABSORBENT, DURABLE: Funkins are made with top quality, pure 100% cotton fabrics that are durable and long lasting, thick enough to clean up spills as well as wipe little hands and faces. Machine washable for easy care. 15"x13" DOUBLE-PLY, CAN BE USED AS A PLACEMAT OR NAPKIN: Our 2-ply placemats provide a barrier for public eating surfaces, making mealtime cleaner and greener. This placemat size can also be used as a napkin for bigger kids. ECO-FRIENDLY: reusable Funkins can be used year after year, making these adorable napkins a smart alternative to toss away paper towels, napkins and baby wipes. Teach your children to care for our earth while saving your family money. TRUSTED AWARD-WINNING FUNKINS BRAND: All Funkins fabrics are CPSIA compliant, tested to ensure safety for little ones. If you have any questions about this product by Funkins, contact us by completing and submitting the form below. If you are looking for a specif part number, please include it with your message.